This little paper pieced block was inspired by the clutch pedal in my car – truly! It’s amazing where inspiration strikes. The pattern and tutorial is thanks to those lovely readers who encouraged me and requested it. Thank you for your nice comments on this little block of mine! It’s a herringbone style block but this one is done with paper piecing (also known as foundation piecing) to minimise wasted fabric, and also so you don’t have to worry about perfect cutting to get your blocks straight. Oh and it’s ideal for charm squares. Seriously now, with all that, what’s not to love?! or 8" x 9 " with a border. 4 x 1.5” strips – 12” long – optional – for borders. Usual sewing bits and pieces – scissors, thread, and oh yes, a sewing machine! Step 1. Prepare the fabric! Cut your charm squares into four equal strips. Take note of any prints and patterns so you can make sure you make the most of them in your block. Sort your fabrics into an order that’s pleasing to you and lay it out ready to sew. Step 2. Shorten your stitch length. Shorten your stitch length. And once more for good measure – shorten your stitch length! Step 3. Sew the fabric into place. The important thing about paper piecing is to make sure your fabric covers not only the section you need to cover, but also the seam allowance. Seam allowance has been included in this pattern and is indicated by the dotted lines. The second important thing to know about paper piecing is you don’t actually sew directly onto the fabric! You will actually be sewing on the printed side of your paper and your fabric will be underneath. So turn your paper over so you are looking at the wrong side and line your fabric up (print side UP for the first piece), looking through the paper to make sure you are covering the lines. If the paper isn’t very transparent, hold it up to a light source so you can see the lines. See how my fabric is sitting over the line? That extra bit makes my seam allowance, approximately 1/4 inch. Now lay the white solid on top, again, making sure that both fabrics now cover that first line. Check and double check. Better to check again than have to use the seam ripper! Now you need to transfer your paper and two fabrics to the sewing machine. You may like to pin your fabrics to the paper to keep them in place. Take your little arrangement gently to the sewing machine. Place it with the fabric on the UNDER side, printed side of the paper UP. Make sure when you slide it under the presser foot that no corners get tucked under. Otherwise you’ll be making fast friends with your seam ripper. Sew along that first diagonal line. Now I like to backstitch at the beginning and end of the line (just within the segment I’m sewing) as I feel it makes the pieces more secure. Not everyone does it, but I’d rather err on the side of caution! Congratulate yourself for taking the first step in paper piecing! The printed side should now look like this. Step 4. Finger press or Iron press – you decide. Clip the threads (I am very lazy about doing this but if you do it now, it saves a bigger mess at the end!) and lay your fabric face up. Press the white fabric up, away from the print fabric. I’ve got young kids so leaving the iron on for whenever I need it is not an option. So I finger press seams on my paper piecing as there’s a lot of sew, press, sew, press happening here. That’s my personal choice. Naturally you get a crisper seam if you use the iron. Up to you! Step 5. Check you’ve covered your behind. Make sure that the white solid is covering all of the section that you need it to. If not… guess what? Seam ripper time. It’s covered? Perfect. Now flip the white back down and make sure your seam allowance is nice and tidy. If not, trim it up to be around 1/4”. Most quilters can eyeball that amount. It doesn’t have to be perfect, just tidy. Step 6. Moving on to the next piece i.e. Time to sew, press, sew, press ad infinitum. Flip that white strip back up again and lay the next printed piece face DOWN onto the white strip. Check again that both of your fabrics cover the next line that you need to sew. I just flip my fabric back on one side so I can eyeball it and make sure it lines up, or you can hold it up to the light and see. Please note: from now on, ALL your fabric pieces are going to be face down onto your main piece. It’s only that first piece that likes to be contrary and is face up. You can see I have a lot of extra white fabric left over after I’ve lined my pieces up. That’s because I’m lazy. :) I don’t cut my pieces to size, I do that after I’ve sewn the seams. So no cause to be alarmed if yours doesn’t look this. And if it does, well done young grasshopper, you are learning the lazy paper piecer secrets. See that big chunk of white fabric I’m chopping off? Yep I’m about to use that for the next solid strip. Now rinse and repeat for the rest of the block. Same principle, all the way to the end. You can do it! Now remember my lesson covering seam allowance? This tiny bit may not cover all of the seam allowance. Mine didn’t. Here’s what your block should look like so far, front and back. Messy hey! Don’t worry, the magic happens when we trim it up. But before you rush off, one last piece to sew. Grab that long strip of white fabric. It’s time to add the centre of your block. This one takes a bit more eyeballing and double checking to make sure you cover the line and that when the fabric is folded back, it will cover the seam allowance as well. If in doubt, use a bigger piece of white fabric. You might like to pin at top and bottom to keep it in place when you transfer the block to the sewing machine. You will be sewing on the INSIDE dark line. You will want the white fabric to then fold back to cover all the way over the dotted line (seam allowance). It’ll look like this when it’s sewn. Messy, messy, messy. Hope it’s not making you twitch. We’ll fix it now. Trusty scissors to the rescue! Cut it back to give yourself a quarter inch seam allowance. You’ll be left with lots of little scraps. You can always save those for further paper piecing endeavours. Trust me, paper piecing is a bit addictive! Press press press. And tada! First side of the block is finished! Take a minute to unkink your neck, remember to breathe again, for you have successfully paper pieced! Another option for the centre strip: You don't have to paper piece the centre strip. If you'd rather avoid another seam, skip this last step of adding the white strip. Instead, go straight to your second block and piece away! Then when you have your two pieces done, ironed and trimmed, join a 1" white strip (the same length as your block) to the centre of one block, then flip over and join it to the other. So it's kind of like adding a 1" strip of sashing to the centre of your block. 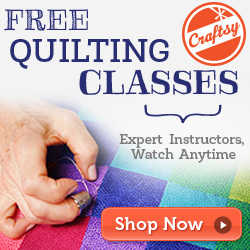 Thank you Sharon from Vroomans Quilts for the suggestion! Now get back to work! Sew up that second side! It’s exactly the same, but the diagonals slant the opposite direction. Will that make a difference? Not really. It’s the same principle. Careful placement, careful sewing, careful trimming, careful pressing. Key word. Careful. Take your time and don’t rush and you’ll be fine! Soon you’ll have something like this! Step 8. Iron and trim. Press your blocks to get all that paper piecing beautiful and tidy. Then take your blocks to the cutting board. Now it’s time for some magic. When you cut your blocks, place them fabric side down so you’re looking at the paper. You’re going to line your ruler up with the dotted line (the seam allowance) and trim straight along it and cut off all those messy scraps and excess paper. Do this on all four sides and you’ll have one beautiful looking block! Here’s the before and after photo. It makes me think of a scruffy haircut being tidied up into a buzz cut. But prettier. Trim both blocks up and your cutting table should look something like this. Tidy on one side, messy on the other! This is a good job to do while you’re watching telly. It’ll make the time go faster! Fold back the paper on the sewn line, then tear it off! Go gently though as you don’t want to ruin your beautiful stitches. I tend to do all my paper piecing in one hit then have a massive tear fest. It’s quite therapeutic. Like popping bubble wrap. Once you’re done with this part – it’s time to sew! Step 10. The home stretch – sew sew sew! Take your blocks back to the machine. Line them up right sides facing – you can pin if you’d like. Then sew a quarter inch seam down the white strip which becomes the centre of your block. Go and press it. I press the centre seam to the side. You could press it open if you wanted. Your choice. Tada! You have a paper pieced block! 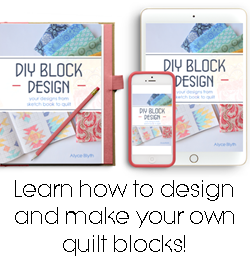 Now you can go ahead and make a whole bunch more of these blocks and sew them together with some lovely white sashing… or you can add borders. I wanted borders on mine to make them look like they’d been framed. My borders are 1.5” wide in white. I sewed the sides on first, then the top and bottom. No photos of that sewing as it’s pretty basic! And here are some more Red Herrings in other colours. Love how this block looks in a range of colours! So what are you waiting for? Go make some Red Herrings of your own! Mine are in the process of becoming a wallhanging. If you do make some red herrings, please let me know! 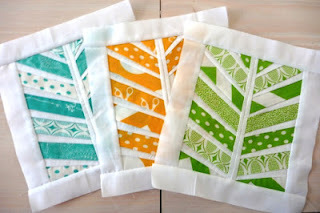 I’d love to see how these look in different fabric and colour combinations! Be creative and have fun! Yay! It's done! Congrats for getting the pattern to print at the correct sizing Kristy from anotha motha! Well done! Great tutorial Kristy! Great tutorial, especially like the advice to unkink your neck and breathe! I am glad to hear I am not the only one who holds their breath whilst sewing each row. Thanks for the great tutorial and for sharing your pattern. This is now on my 'to do' list. Thank you thank you thank you! Your hard work is appreciated, and I'm adding it to my list. And starting soon! what a fun project - mind if I wait another year? I'm trying to overcome my fears of paper piecing..
Great tutorial and 'blog hop' day - thanks for sharing!!! I haven't done much paper piecing but will have to try this one as I love it - especially in the fabric you used too!! What a great paper-piecing block and tutorial! Thanks for sharing, how fun! That's a great block, love the half moon modern fabrics! Oh my gosh, I love this! Don't you love it when inspiration strikes from the seemingly strangest things? I have to try this sometime. Thanks for the tute! Great pattern and project - thank you for sharing. Great tutorial. I've done a little paper piecing and have a sketch for something that just might be best paper pieced. Thanks for the inspiration. Seriously, LOVE! Thank you so much for posting! this will be my first paper piecing project! i really love this block, i'm so excited. I love your tutorial!! Thanks for sharing with us!! I really enjoyed making this block and I love that your pedal gave you inspiration; that is just way to funny! I look forward to your bloghop on paper pieced blocks. Thanks for inspiring us all with your blocks. Love your palm pattern. I think I'll try it out with darker color where you have white, and lighter of the same color where you have the colors now. Thanks for the pattern. I love to paper piece. This is a beautiful block!! Could you share your completed quilt measurement and the size of pieces between your blocks? Love the pattern...looks like a great project dor a first time paper piercer! Thanks. Hi Kathy. You came up as a no reply blogger so hopefully you check back here for a reply. I actually don't have the completed measurements - and can't remember back that far hehe! I The quilt is packed away so I wasn't able to find it to re-measure to be able to answer. It is wallhanging size (not big enough for a lap quilt). Great Block Idea. I printed your page and plan to go play with it this afternoon. Do you know if there is any special printing parameters we have to do to this or just print and sew? Thanks. Tonja W.
I just came across this block and think it's simply wonderful! How generous of you to share it with all of us. Thank you very much!